Jonathan Brosseau, President & General Manager of Groupe Brosseau Vitrerie, Blainville, first began working as a glazier in 2002. An entrepreneur at heart, he took an entrepreneurship course with the APCHQ (Association provinciale des constructeurs d’habitations du Québec, formerly the Association provinciale des constructeurs d’habitations du Québec) in 2010. As an experienced master glazier who had honed his craft at a renowned commercial glaziers, he was ready to start his own business and make his dreams a reality. He already had a strong desire to succeed so, after acquiring a truck and an employee, the dream came true. Groupe Brosseau Vitrerie now has a fleet of over 10 trucks, more than 30 loyal employees, an administrative office and just as much enthusiasm! 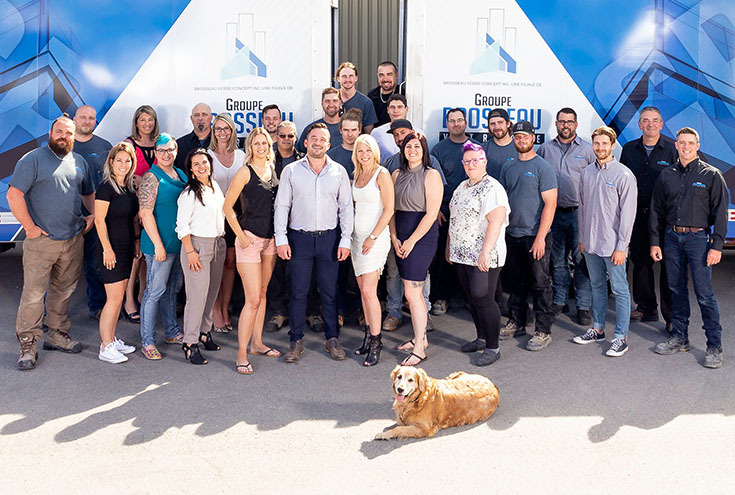 The company started out as Brosseau Verre Concept and Jonathan Brosseau’s goal was to surround himself with a team of solid, tightly-knit professionals who were reliable and capable of delivering large-scale projects. Thanks to the skillset, aptitude and teamwork of the management team and employees in the field, the company has grown and now operates under the name Groupe Brosseau Vitrerie. Working at Groupe Brosseau Vitrerie is about deciding to develop your potential in a dynamic, passionate and proud team of professionals and being part of a large family that is constantly growing. Are you interested in this challenge? Apply now!